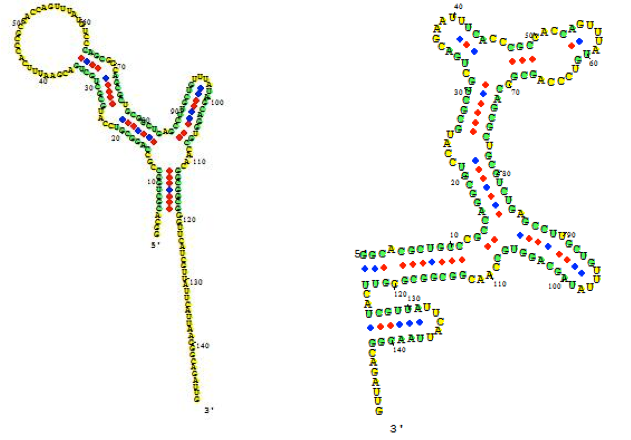 The figure below shows an RNA sequence fold in Visual OMP with its Target Accessibility plot, which shows a user the best areas, given experimental conditions, to design primers and probes. The regions where the target complexity (green) and target unfolding DG (blue) overlap on the Accessibility plot are the regions where the strongest secondary structure exists, and as such, these areas should be avoided for design. The Target Accessibility plot for the RNA sequence fold top left under experimental conditions of 55 ˚C, 50 mM NaCl and 0.5 mM MgCl2. The Target Accessibility plot for the RNA sequence fold top right under experimental conditions of 37 ˚C and 1 M NaCl.